Inside an outworld cantina on the planet Junction, Valance the Hunter captures another bounty, then turns him in to a junk dealer named Skinker to claim the reward. Having analyzed Rebel supply methods, Valance has deduced it's only a matter of time before the Rebel he's after shows up on this world. Sure enough, after evading an Imperial ship, Luke and Threepio arrive on Junction, seeking supplies as well the parts needed to repair the damaged Artoo. Spotting Skinker's shop first, they head inside, and Skinker sends an underling to fetch Valance. 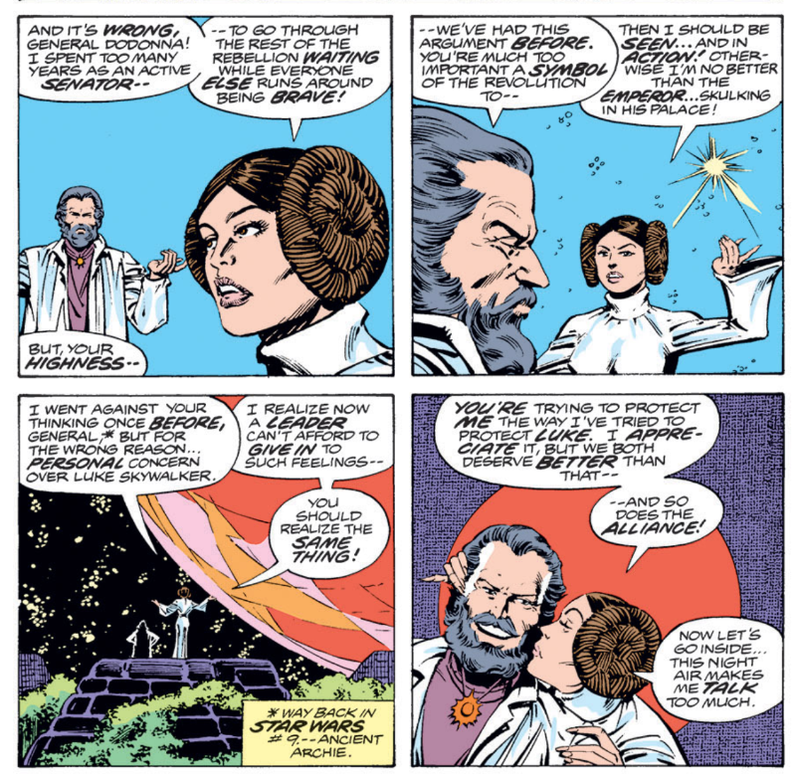 Meanwhile, back on Yavin Four, Princess Leia and General Dodonna argue about Leia's role in the Rebellion. 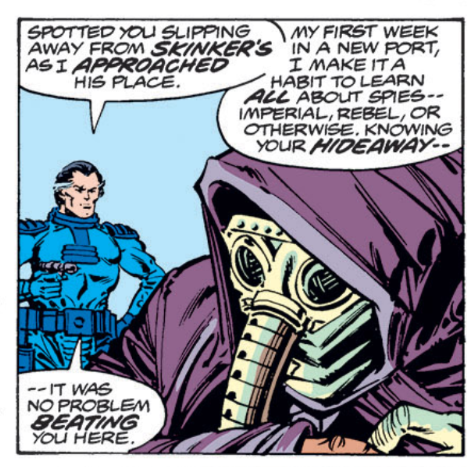 Back on Junction, Valance kills an Imperial spy before he can report on Luke's presence to Darth Vader, then proceeds to confront Luke at Skinker's shop. Insisting Threepio make a run for it with the parts Artoo needs, Luke attempts to hold off Valance. 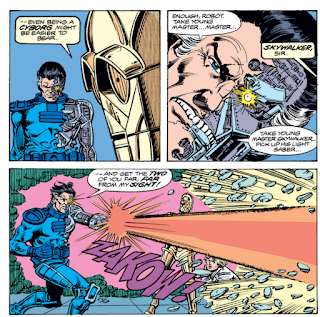 Luke's use of a lightsaber surprises Valance, but Valance's cybernetic enhancements give him an edge, and he soon has Luke at his mercy. 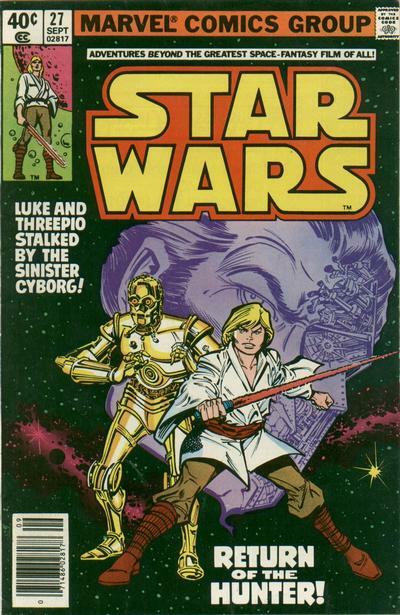 However, Threepio intervenes, having come back to help Luke. His willingness to sacrifice himself for a human confounds Valance, who insists that droids and humans don't behave that way. Threepio counters that if more of them did, perhaps being a cyborg who be easier to bear, prompting an angry Valance to let Threepio and Luke leave alive, though Luke doubts it's the last they'll hear of Valance. 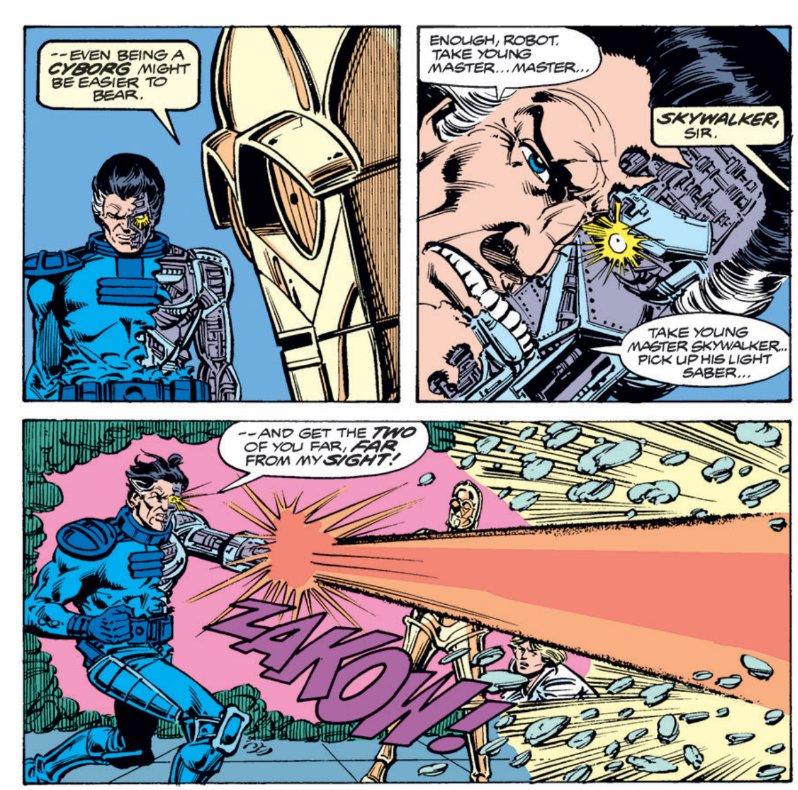 This issue features the return of Valance the Hunter, last seen in his first appearance in issue #16 and last mentioned in issue #21, and puts him face-to-face with Luke, with Valance learning Luke's last name before experiencing an apparent change of heart and allowing Luke to live, setting up Valance's next appearance. 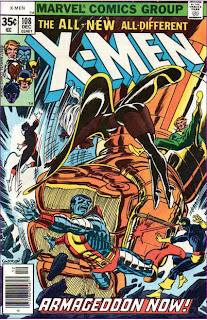 This is the first issue of the series to credit Jim Shooter as Editor-in-Chief (his previous credits in the series were usually something like "consulting editor". Hauling stuff around (stuff=captured bounties) is derogatorily referred to as "droid work". In a bit I kind of genuine love, Valance is shown to just destroy random droids for fun in his spare time. Luke notes that Junction is the biggest city he's ever seen and spent time in, a nice nod to his farm boy roots. 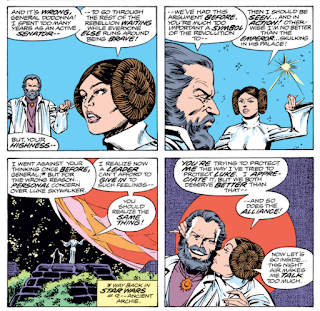 The idea of Princess Leia being a symbol to the Rebels, and thus more valuable as such than as a front line fighter/agent, is put forth by General Dodonna in this issue, which is an idea that is returned to again later by both the Dark Horse Expanded Universe comics and the current Marvel ones. 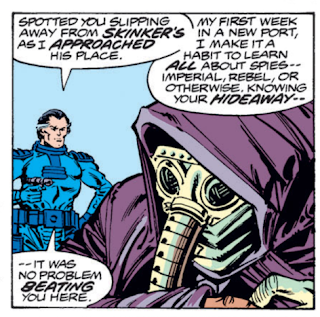 On Junction, Valance kills an Imperial spy who, while obviously not the same being/species as Garindan, the Imperial spy on Tatootine in A New Hope, does have a long snout-like appendage that strikes me as possibly being a visual nod to that earlier character. Luke is depicted with a red-bladed lightsaber on the color, which we all know is incorrect. Ships are referred to as "dropping out of warp". The next issue box teases the return of Jabba the Hutt, but spells "Hutt" with one "t". There's a really great full page spread when Luke discovers a Star Destroyer hiding behind a planet, in which Infantino takes advantage of the lack of a horizontal/vertical plane in space. Essentially a done-in-one issue, the story here is built on events from two previous issues: the damage done to Artoo in #26, and the looming threat of Valance the Hunter as he attempts to track down Luke. 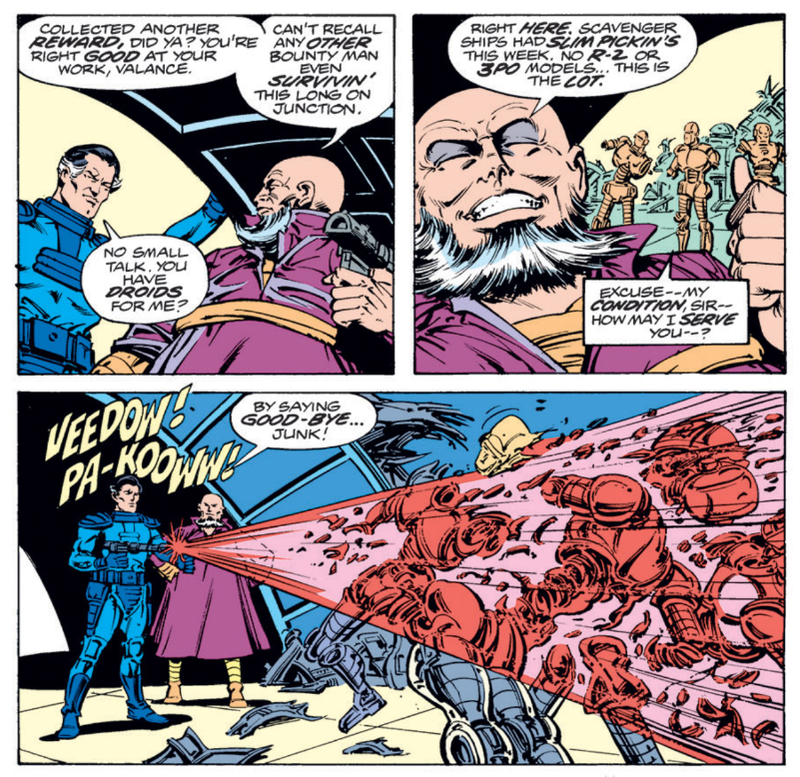 As such, it works wonderfully to make the series read like it's telling one long narrative, rather than just serving as a sequential collection of standalone stories (which, of course, also makes the series feel very much in step with what Marvel was doing with their other books at this time, even though this series falls outside the purview of the Marvel Universe). 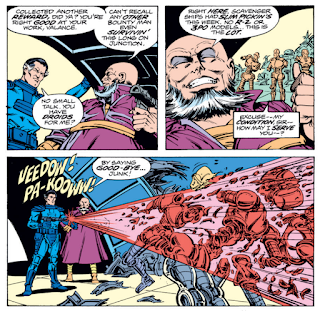 Valance himself is a perfect representation of this: introduced in one issue (which itself called back to an earlier story, featuring as it did Jaxxon, Amaiza and the Starkiller Kid), mentioned but not seen several issues later (just to keep him in the minds of the readers) and then brought into direct conflict with Luke in this issue. 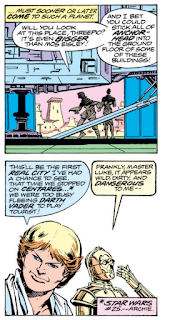 Even here, the sequential narrative is served, as Luke manages to escape but Valance remains alive and at large, his attitude possibly changed by his encounter but ready to return again in a future issue. 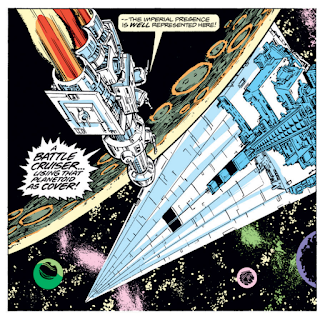 If "Siege of Yavin" was the series functioning as direct continuation of the events of Star Wars for the first time, then this issue shows how comfortable Goodwin, Infantino and company have become at approaching the series just like any other long-form sequential comic book series. Han and Chewbacca confront Jabba the Hut(t). This is an issue I had originally upon first publication and I read it to death! Beaten up spine, dog-eared pages and a fondness in my heart for Infantino's T-square jaws! 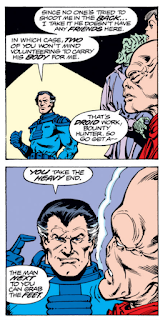 Wish Marvel would bring back Valance. 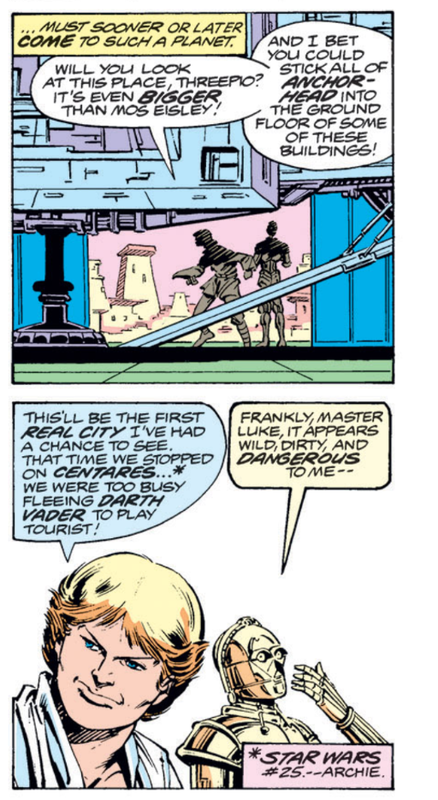 I'm with you on Valance's hobby, which is even funnier because he buys droids specifically to kill. He turns in bounties, then spends that money to buy things just so he can destroy them. I hate mushrooms, but I can't see myself buying a pound of the things just so I could bring them home and burn them or something. That’s actually “P. Goldberg” — as in Petra Goldberg, later Petra Scotese. Dressed as Neil Gaiman’s Sandman!